We Have Two Happy Hours Daily! fior di latte, parmigiano reggiano, sliced tomatoes, crispy smoked pancetta, basil, garlic, extra virgin olive oil and our house-made roasted red pepper sauce. Topped with fresh bibb lettuce after the oven. Barboncino Wins Edible Brooklyn's Cocktail Challenge! 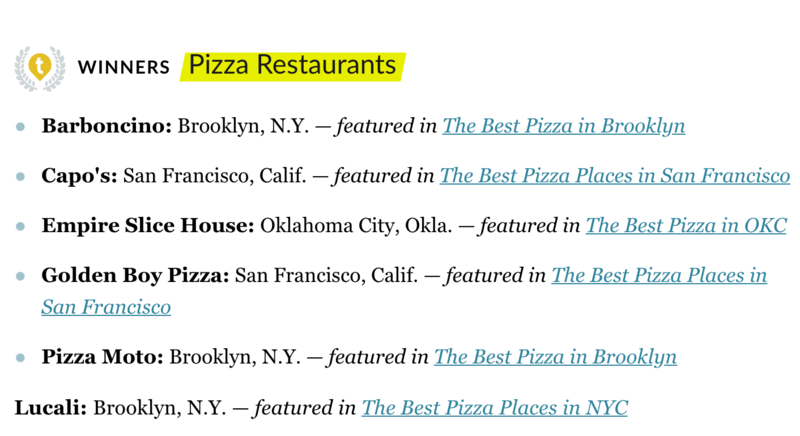 The Best Food Neighborhoods in Brooklyn, Ranked -- Crown Heights is #2! Happy Halloween! Time to eat…PIZZA! Top 8 Bars In Brooklyn With Amazing Happy Hour Specials! "Barboncino," or, Can a Personal Pizza Gentrify a Neighborhood? More Than Just Pizza at Franklin Avenue's Barboncino! Neapoilitan pizza cooked in a wood burning oven! Since 1984, Ron has founded and operated seven restaurants and food-related businesses but he considers Barboncino the culmination of everything he loves about hospitality and the restaurant business. A pizza enthusiast his whole life, he spent six summers in Italy before apprenticing in the art of Neapolitan pizza-making with the company from which he bought Barboncino's famous wood-burning oven. Ron imported the oven from the company, located outside of Naples, Italy, and the rest is history! Ron is also an award winning filmmaker, having written/produced/directed two independent feature films (A Perfect Fit and Consent). The Barboncino family is made up of a wonderful group of people who understand that our most important mission is to take care of our guests -- to treat every visit like it's the first and to make everyone feel at home. They're actors, singers, musicians, fine artists, writers of poetry, prose and more ... We love working together! $2 off all draft beers, every spirit and mixed drinks! Come enjoy with us! $2 off all draft beers, every spirit and mixed drinks! Questions? Comments? Send us an email using the contact form below. We love hearing from you!